Essential oils are naturally volatile, which means they evaporate easily, in normal temperatures. When a drop of essential oil is applied to the surface of the terra cotta piece, it is absorbed into the tiny pores of the kiln-fired clay. From there it slowly and naturally diffuses into the air around it. 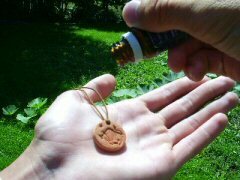 Lay the pendant flat and apply one drop of essential oil. Allow the oil time to become completely absorbed into the clay. When the oil is completely absorbed, it is ready to wear. Put the pendant around your neck and adjust the sliding knots to achieve the length of cord you prefer! Now it will diffuse into your personal breathing space wherever you go all day long! Our wonderful terracotta necklaces are made in Canada by a small at home company. They are simple terracotta, no finishes, just pure and natural. One drop of essential oil is all you need to keep the aroma of the oil around you all day.